Episode 11 dedicates a considerable amount of time to show us how Ash and Eiji settle into living alone together. When Max offers to take Eiji away, Ash refuses, and we know that Eiji will be moving in with him in the apartment he buys towards the end of the episode. This is very much a “calm before the storm” type of episode, where we’re able to “pause” the conflict for a bit and enjoy some time with the boys before all hell breaks loose. However, the relative calmness also allows past events to catch up to Ash, causing him to finally break down. While Ash and Eiji don’t “talk about love” or become a couple, this kind of reference (marriage and hardships) in the title of an episode that centers on them it’s clearly not a coincidence. When Ash and Eiji change out of their tattered clothes, they wear each other’s colors. Red is a prominent color in Ash’s color palette, while blue is one in Eiji’s. We have also seen plenty of instances where the boys wear both colors, mostly with Eiji. I’ve talked about it in detail in the instances where this happened, and the short version is that this combination is there to connect them and mark them as each other’s match. Still, this is the first time we see them exchanging colors, and it happens when things finally slow down a little and they get some time alone. Red is used as a visual accent as well. In the scene where Alex, Kong, and Bones are too scared to even attempt waking up Ash, they’re sitting on opaque red couches, while Eiji is sitting on a more saturated one. Eiji approaches the situation light-heartedly, failing to see the problem even when the boys explain to him “how scary” Ash is when he wakes up. Eiji is not even remotely scared of Ash, and he has no reason to be. All Ash does when Eiji wakes him up is glare–even thought Eiji literally smacked him awake. 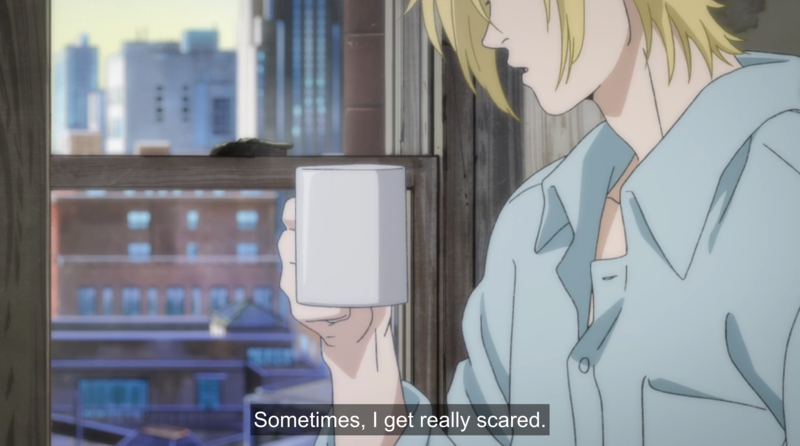 Contrasting the scared boys’ expectations (that come from experience) with what actually happens notably indicates how Ash softens around Eiji. That’s not the only time we see such a contrast. Ash already anticipates that Arthur will come after him and starts to put a plan into motion. He gives orders to his gang and then turns to Eiji, and both boys sit down and eat. There’s a couple of things that are worth noticing here. First is Eiji’s observation: Ash commands absolute respect from his gang. Eiji notices how the boys see Ash “as their king,” however, Ash isn’t framed as such. He’s certainly at the center, but he’s at the same level as the boys. If anything, the boys are the ones who are framed as large figures, not unlike Ash in the previous episode. What this is telling us is that, while the boys might perceive Ash in a certain way (and Ash might be pretty dang rude), Ash doesn’t consider (or positions) himself above them. The boys being large figures gathering around Ash is telling us that they are the ones giving Ash power. After all, what’s a leader without people to lead? If anything, Alex, Bones, and Kong–the principal gang characters–are the ones getting a slightly tilted angle while looking strong and confident. Eiji then notices that “Ash, the gang leader” is not the Ash he knows, which is quickly reaffirmed with the way Ash’s voice and behavior changes after he delivers his orders and turns to Eiji. While we get a clear picture of how the boys see Ash, how they see Eiji is more subtle. Ash and Eiji sit down to eat the food the boys bought for them, and we quickly see that it’s Japanese. Ash notices that they bought it for Eiji, meaning that the boys appreciate Eiji–who they’re barely just getting to know–enough to care about making him feel comfortable. It’s a subtle way to also make a connection between people from different cultures. After all, if you go out of your way to buy someone traditional food from their country, it’s probably because you want to make them feel at home. It’s the Japanese food what serves as an icebreaker for the boys, leading to Ash showing interest in knowing more personal things about Eiji and exchanging a personal story himself. We get a flashback with Ash teaching Eiji how to shoot, which I find very interesting for multiple reasons. One of them is that visually, it reminds us of how that red-blue combination I mentioned is used. After interrupting them, Ibe sends Eiji elsewhere and tells Ash that he and Eiji “come from different worlds,” separating the boys both with his words and his actions. However, remembering that moment, Ibe focuses on how Ash was able to relax and open up in Eiji’s company. Max then put into words the thing Ibe’s getting at: Ash is only able to act his age around Eiji. Ash is someone whose innocence was stolen at a disturbingly young age, and he has been unable to just be a boy ever since. The normalcy Eiji brings into his life is precious. The other notable thing in the flashback is that it reminds us of the gun, but we will get there in a minute. Episode 11 shows us the various ways in which Ash’s abuse still has an effect on him. The first one comes after a joke with Eiji. I said that the calmness the boys’ experience allows “Ash’s demons” to catch up to him, and it also gives Eiji time and space to better absorb the things that have just happened. We get a scene where Eiji notes how Ash rejects a gun model that would basically make killing easier. Soon after this, Eiji questions “who’s the real Ash” and whether or not the killer and the pouty boy–darkness and light, if you will–could be just parts of what makes him who he is. It makes sense for Eiji to question this, after all, we have been told plenty of times that he comes from a “normal” environment, and the escape from the mansion was the first time Eiji saw Ash going into such a rampage. Still, when Eiji says that he’s not afraid of Ash, he means it. When Eiji questions Ash, it’s not because he fears for his own safety. On the contrary, he fears for Ash’s safety; he fears that Ash world might end up consuming him, taking him somewhere Eiji can’t reach him. This is when we get “the joke.” Ash offers to show Eiji his pubic hair but quickly retracts when Eiji responds positively. We see Ash casually being in various states of undress around Eiji, and the just fact that he’s able to joke like this says a lot about how comfortable he is around Eiji. Still, his panicked reaction also says plenty about the effect his abuse still has on him. In short, it’s a moment when Eiji expresses his fear of losing Ash to his toxic world while we see some of the effects said world had already left on Ash. However–and this is where things get more interesting–the adaptation has been establishing certain things from the moment Ash and Eiji met. I said that we would be getting back to the gun in the flashback in a minute. Well, now’s the time. Let’s talk about guns. In a story like Banana Fish, guns are everywhere. A gun being present when Ash and Eiji are alone–and without any present danger–it’s rarer though. It’s there to mark Eiji’s naivety and trustworthiness, as a mean to protect himself and as a way to give him a bonding moment with Ash. The gun–and how well either boy can use it–generally serves to illustrate how both boys “come from different worlds” as well. However, in those scenes, this show has been adding details to tell us that the gun means something more. It all starts when Eiji asks Ash to let him hold his gun the first time they met. 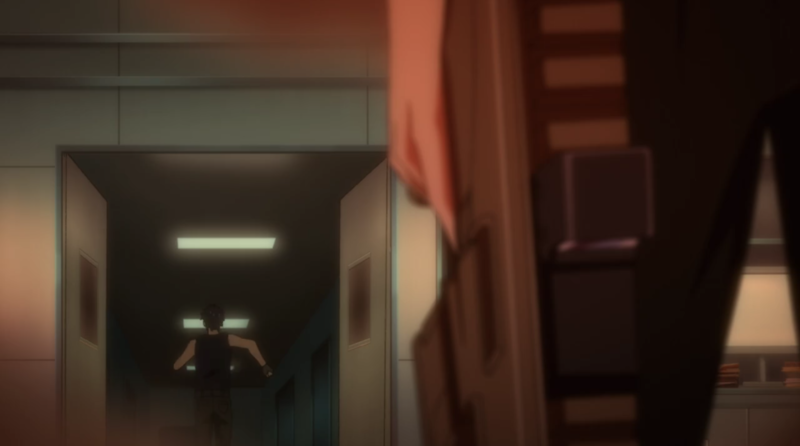 Everything about the way the scene it’s framed works as a metaphor for consent; Ash lets Eiji “touch his gun” even though he never lets anyone touch it, and he does it willingly after Eiji asks for permission. A few episodes after that, Ash gives Eiji a gun so he could protect himself. He leaves the gun in the bed, and when Eiji reaches out to take it and point it towards the viewer, there’s a rainbow in the ray of light that touches Eiji, which becomes stronger after he takes the gun. This is not the first time the show uses those colors to code a scene between the boys romantically, although this time, it’s way more subtle. It’s still notable that those colors only get emphasis when Eiji decides to touch the gun and hold it confidently. Then there’s the scene that we see in Ibe’s flashback. Ash is the one who offers Eiji the gun, and Eiji makes sure it’s okay to touch it before accepting. While showing Eiji how to shoot, Ash gets very close and puts his arms around Eiji, who gets momentarily flustered before concentrating on the task. Ash only stops touching Eiji when he actually has to shoot, and curiously enough, we don’t see him getting separated from Eiji’s body. While I’ve been saying that these details are meant to make us see those scenes in a romantic light, the undertones are specifically sexual. Which brings me back to “the joke” in episode 11. When Ash asks Eiji if he “wants to look at the hair down there” Eiji makes the same excited face he did when Ash offered to let him shoot his gun. 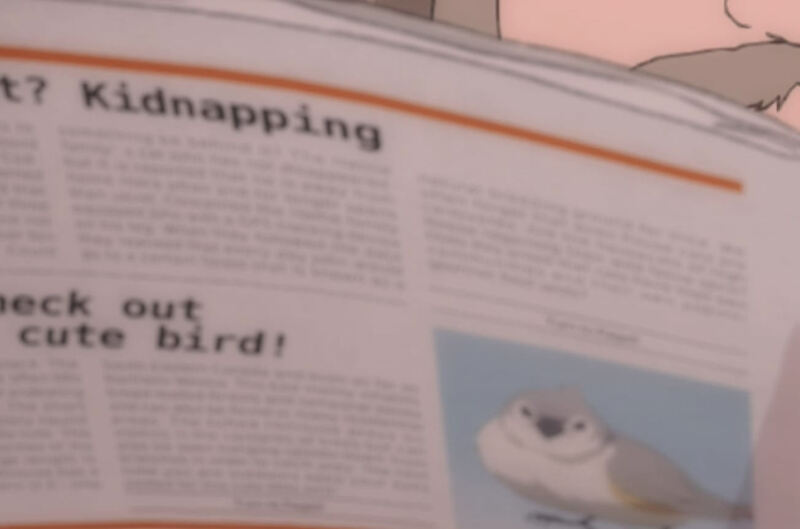 It’s fun to joke about it, but in a show that goes as far as to put a tufted titmouse in a newspaper (that doesn’t even get any focus) to foreshadow Eiji getting kidnaped, these little details are hardly a coincidence. The fact that Eiji’s eyes get even sparklier when he’s offered to see the real thing it’s not a coincidence either. It reassures us that this sweet boy’s intentions are pure; he wouldn’t have betrayed Ash’s trust. It’s more than Ash can handle, so he backs off. He then tells Eiji–blushy and scowling–that “he’s weird” while putting distance between them. Like I’ve already mentioned, the physical distance reinforces another type of distance Eiji is fearing at that moment. I emphasized this when I analyzed the OP some time ago, which I find very relevant here: Ash is someone who masks fear with rudeness. Again, this is an episode where we see how Ash’s trauma has a big effect on him, and the possibility of crossing lines he’s not ready to cross is more than enough reason to feel afraid. Ash says that Eiji’s weird, but there’s nothing weird or strange in the way Eiji reacts. Ash is the one who (understandably) has trouble understanding Eiji’s honesty and pure intentions. I brought up the gun as a metaphor with sexual undertones mainly because of the deliberate changes in the scene when Ash’s wakes up to see Eiji sleeping over him. You see, in the original, Ash finds Eiji sleeping with his arm over him while his head is in the space between his chest and his stomach. Here, Ash wakes up to find that Eiji’s head is practically over his croch (while looking like he’s hugging it). There’s even a slight pause in the shot that reveals their positions, meant for us to pay attention to it. Ash notices Eiji when he tries to get up, and there’s also a slight pause when Ash just looks at him, a blush on his cheek. Ash position is open when their positions are revealed, and when Ash realizes what’s going on, he only blushes, expression soft. This is sexual, folks. I mentioned the gun to better explain how this doesn’t come out of nowhere. It happens after multiple scenes where Ash is the one offering and/or Eiji asks and make sure if it’s okay before proceeding. (Also, did you notice how Eiji wears blue and red, marking him as Ash’s match in those instances.) By adding these details, what the show is telling us is that, while the effects of Ash’s trauma might result in him doing things like pushing Eiji away when he’s scared, he doesn’t reject Eiji. At this point, we don’t really need to be told that Eiji is worthy of his trust, but what this tells us is that it also applies in the sexual aspect. Something else that this episode establishes is that Eiji is Ash’s rock. Ash breaks down after having a nightmare, revealing to us just how hunted he’s still is by the things that happened to him and the roles he has been forced into. When he says that he’s scared of himself for killing “without feeling anything” we get the same shot we got when a horrified Ash looked at his hands after shooting Shorter, visually contradicting his statement. 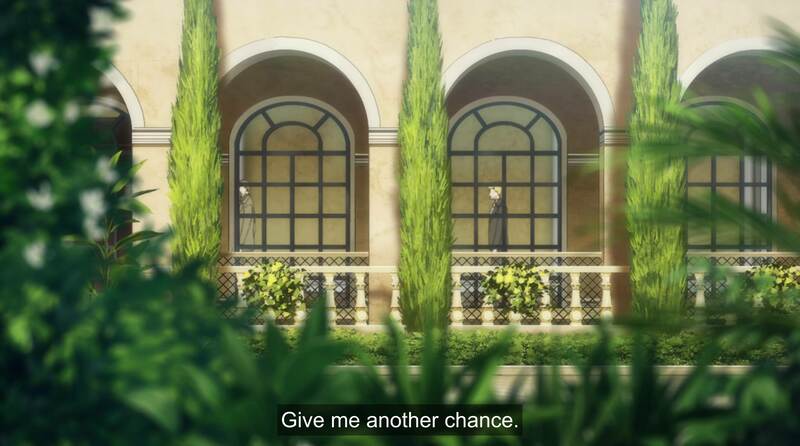 We’ve already seen Eiji’s strength and willingness to meet Ash halfway emotionally last week, and every time Eiji goes beyond that, it deeply affects Ash, who reacts in ways that tell us that he hasn’t experienced this before. Eiji doesn’t only comfort Ash, he willingly takes on half of the blame, telling Ash that if he’s going to punish himself, then he won’t be alone in his pain. When it seems like Ash is about to completely break apart, Eiji responds with unconditional love. Eiji promises to stay by his side “even if the whole world turns on him,” and notably adds “if it’s okay with you,” showing us once again how Eiji is always checking if Ash is okay with him, rather than imposing himself on him. Whether is the fun and jokes, or the harsh and painful, this episode very clearly shows us how Eiji is there for Ash–and he wants to be there. Ash wants Eiji to be with him as well, he tells him as much. Silly fears like pumpkins or the darkest fears Ash hides from everyone; Ash shares it all with Eiji. Speaking of fun and silly, we get some lighthearted moments with the boys, reaffirming what Max told us: with Eiji, Ash is able to act like a boy his age. I’m contractually obliged to mention the “onii-chan” and the “nii-sama” that comes up when Eiji, concerned for Ash’s safety, demands to be heard because he’s older (and therefore, wiser or something). Ash teases the hell out of Eiji, playfully calling him onii-chan and switching to the most “respectful” nii-sama when a blushy and grumpy Eiji lets him know that he’s aware that he’s being teased. Yes, it’s normal to use it with people who aren’t related to you. No, it doesn’t mean Ash sees Eiji as a bro figure. Is one of those things that reminds you where this comes from, even though the story is set in the U.S. and characters are supposed to be speaking English. Fun fact: this understanding made the English localization use “mister older and wiser” in that one instance, and just omitted the word after that. It’s also worth to notice those two pigeons we see because birds always mean something in this show. We see feral pigeons–which derive from domestic pigeons. These are city pigeons and well, we’re in New York. The two pigeons are connected to the boys when we cut to them before cutting back to mummy Ash, and we see them again after Ash wakes up after falling asleep with Eiji. The light of a new day covers Ash as he prepares himself to put his plan into motion. While the light reaches the pigeons, they’re in the shadow’s side, which can be symbolic of what’s to come. However, pigeons can be notable symbols of resilience. 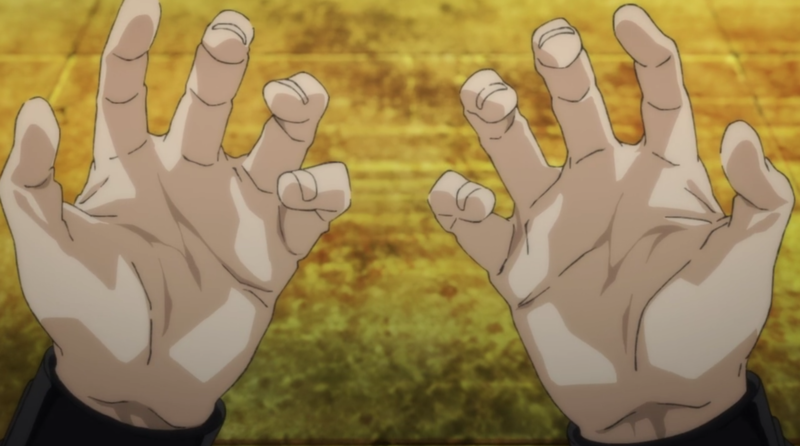 This episode dedicating most of it time to Ash and Eiji left very little to focus on the rest, and part of it suffers from it. Ash delivers a huge blow to the absolute trash we have as the main antagonist. He very nicely explains what and how he did it with graphics, so I won’t mention it again. This scene sort of gave me a little bit of an anachronistic feeling, not only because Max’s mustache is out, but because not a part in Ash’s plan was touched or updated. The things that pop out the most to me here are Ash’s disgusted face and mentions of disassociating during his abuse, so I don’t really have strong feelings about that. We also get to see Dino suffering, which is essential. I’m not even joking. After this, Dino gives all power to Arthur–a completely different attitude from the one he had at the beginning of the episode–entrusting him with defeating and capturing Ash. Arthur wears gray, a color that can convey reliability, which he has also worn when he got in the way of Ash killing Dino. Goddamn you, Arthur. Ash also wears gray when he puts his plan into motion, but in his case, I’m inclined to think of it as an unemotional gray. 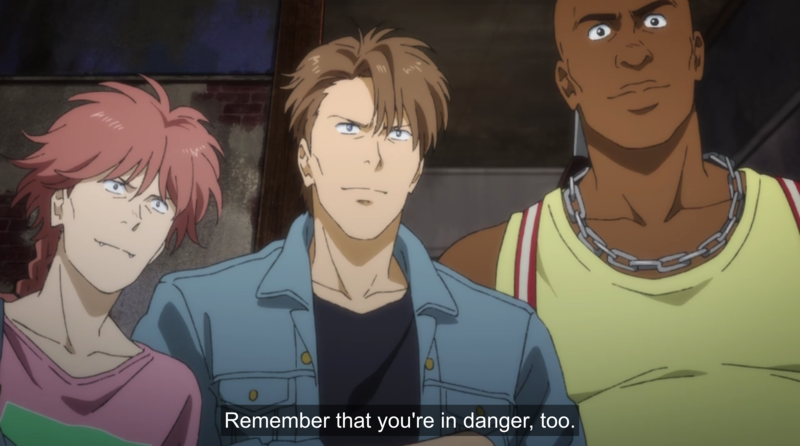 After all, it’s a color Ash, Eiji and Shorter have worn in situations where they were being forced to do things they didn’t want to do. We see this scene during the credits, which unfortunately means we sacrifice some tension. On the other hand, this show sure knows how to make our boy look like a badass!